Ending the season in fourth position would be a good result for Shillong Lajong FC, but star striker Aser Dipanda Dicka wants to push for even more as the 2016-17 season of the I-League draws to a close. 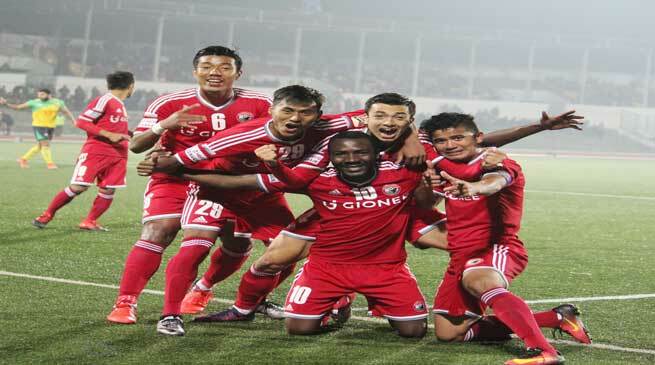 With just five matches left, Lajong have 20 points in their kitty from 13 outings and are in fourth place. Some of the toughest fixtures are yet to come for the Reds, however, with Lajong first playing away at DSK Shivajians on 8th April before hosting Mohun Bagan, Bengaluru FC and league leaders Aizawl FC. Before coming to India, the Cameroonian played much of his professional football in Spain. He joined Shivajians for the 2015-16 season and was the club’s top scorer that year with seven goals, a feat he has already surpassed at Lajong, though his opening few matches with the Reds were far from plain sailing. “I was not fully fit in the first three matches. I finally got my scoring rhythm in the games we played at home and then I started to score in almost every match,” he explained. “There are five matches left and I want to score as many goals possible and for that I am going to give my best. It’s not just about being the top scorer. What matters the most is we finish the league in a good position,” he added. The 28-year-old’s bubbly personality, positive energy and never-say-die attitude quickly made him a favourite among the Lajong Faithfuls, who have clamoured to see more of that Dicka magic that has earned the footballer four man-of-the-match awards with the Reds so far. Despite that personal success, he is the first to admit that it would not have been possible on his own. “Credit has to go to my team mates and the fans. They have given me a lot of motivation to do better,” Dicka, who is one of seven Reds this season to have registered more than 1,000 minutes on the pitch, said. Being one of the senior figures in the Lajong squad has not diminished Dicka’s ability to gel with the youngsters and the rest of his team mates with the No. 10 creating lasting friendships here in Shillong. “I enjoy playing with them a lot and they are very good on and off the field. We are like a happy family who have bonded and gotten along so well. We work hard together, combine and understand each other on the pitch and together produce brilliant results,” he said. The Pine City has also found a place in Dicka’s heart, despite the cold weather he was greeted with when he joined Lajong at the start of the year. “After some time I got used to the cold and I love it out here. Shillong, Meghalaya, is stunning. It is so beautiful and I have fallen madly in love with this place. I also love the people here, they are all very kind and humble,” the Cameroonian opined. Looking ahead, Dicka knows that the encounter with his former club this Saturday is going to be no walk in the park. Lajong have not beaten Shivajians in three I-League encounters so far and last lost 2-1 at home in February. “We will have to fight hard until the final whistle. Our target is to collect three points from this game and come back home ready to face two big opponents in Mohun Bagan and Bengaluru,” Dicka signed off. Shillong Lajong’s match against DSK Shivajians will be held in Pune on Saturday, 8th April, and will be broadcast live on Ten2 at 7:05PM.